Ibcos announces that four of its customers received the prestigious Service Dealer Award during the ceremony held at the Oxford Belfry Hotel in Thame, Oxfordshire, on November 16. 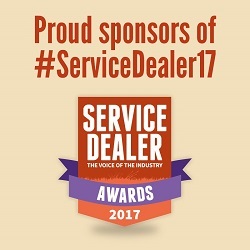 Poole, Dorset, December 1, 2017 – Ibcos Computers Ltd., a leading business management software supplier for agricultural, groundcare, and construction dealers, is pleased to announce that four of its customers received the prestigious Service Dealer Award during the ceremony held at the Oxford Belfry Hotel in Thame, Oxfordshire, on November 16th. • Grant Roberts from Cornwall Farm Machinery Ltd – Apprentice of the Year. The judges praised Roberts for his hard work on the service side in addition to getting named the John Deere Parts Tech Apprentice of the Year by John Deere officials and becoming the finalist in the 2017 Cornwall Apprenticeship Awards. Ibcos continuously upgrades its business management software based on the suggestions from its customers to ensure they always have the tools they need to succeed. Those who wish to learn more about Ibcos can do so by visiting its official website at www.ibcos.co.uk.